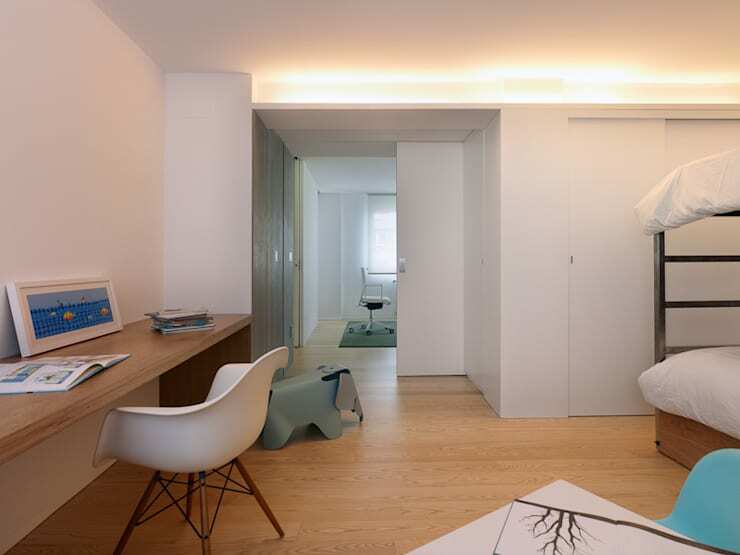 This family apartment in the northern Spanish province of Galicia possesses an understated modernity and a very flexible approach to space. As many creative professionals know, imposed limitations can often generate the most innovative results. In this regard, the architects were more than blessed with a bounty of challenges. The apartment is a decent size at 140 meters square. But the distribution of the rooms was problematic with a blind hallway opening up to a series of small, boxy rooms and various outside windows at close range to neighbouring buildings. Luckily the new inhabitants wanted to completely rethink the system of layout. 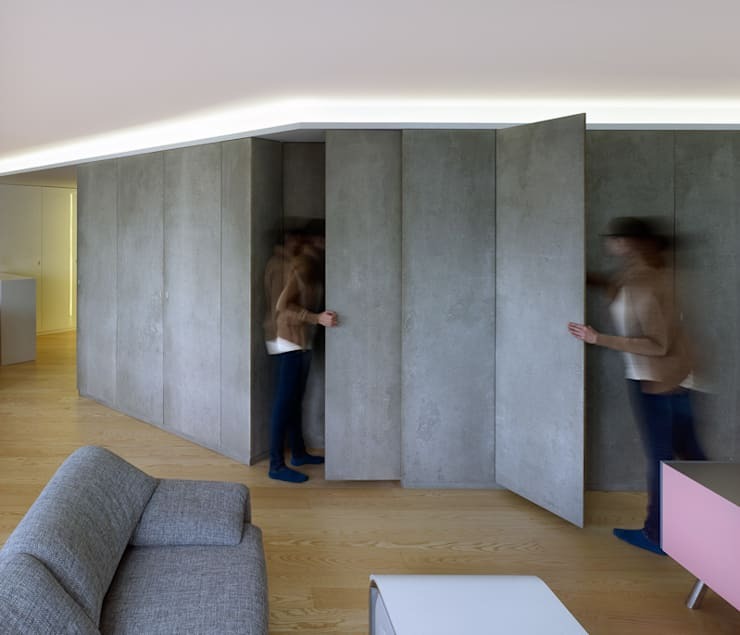 Architects Castroferro took on the challenge and came up with a series of folding walls that could transform the space according to various changing daily needs of the family. Come with us on a photo tour of this completely, unique, foldable home. The architects conceived of a very large interior space that was only compartmentalised by the distribution of furniture. This large living area was created along the entire length of the facade, while the bedroom areas were relegated to the back patio side. The decor had not been updated since the 1960's, so the decor was also completely refreshed. A bright colour scheme has been chosen to brighten up the space. Subtle grey fabrics, lots of white and pale wood finishes were also installed. Here we can see the grey, folding walls that form the central wall in this construction. Although they provide vital storage for the home, we can see the panels on the left in a transition state. These walls can be folded back and opened up to connect the living area with the children's rooms during the day. From this angle, we have a view of the living area from the children's bedroom. This enables the parents to keep a close eye on their small children, while also enjoying the ample space of the living area. The finishes here are bright and the space is connected by a white, sliding door. From the main living area, we can see into the nursery. Again, the space is connected by the smooth wooden floors and the simple, understated grey of the folding doors, which together creates an intimate yet spacious area. 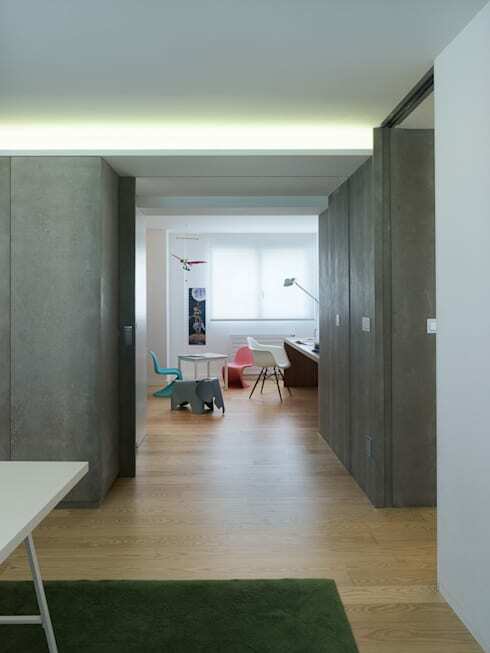 Te beautiful detailing of the cornicing lighting accentuates the smoothness of the concrete interior, giving off a modern and stylish feel. 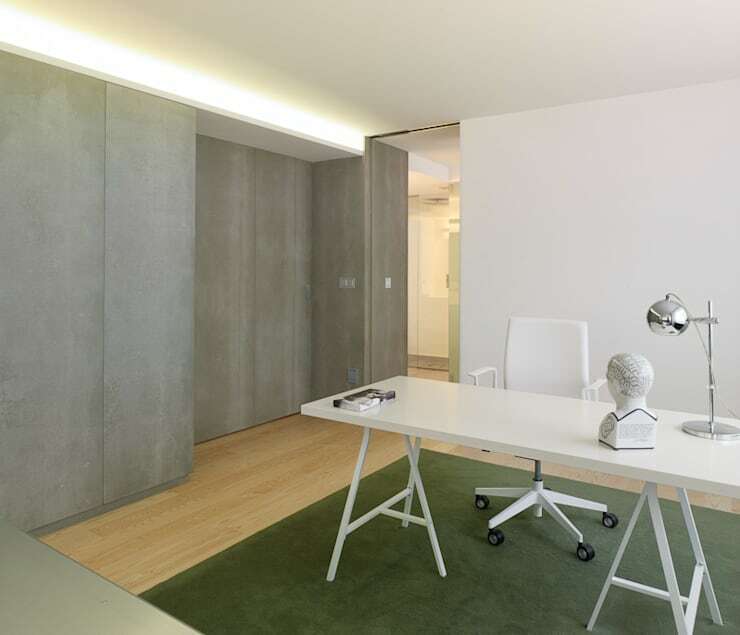 In the home office, bright white walls and a white desk create a simple contrast to the darker grey panels of the closed walls. 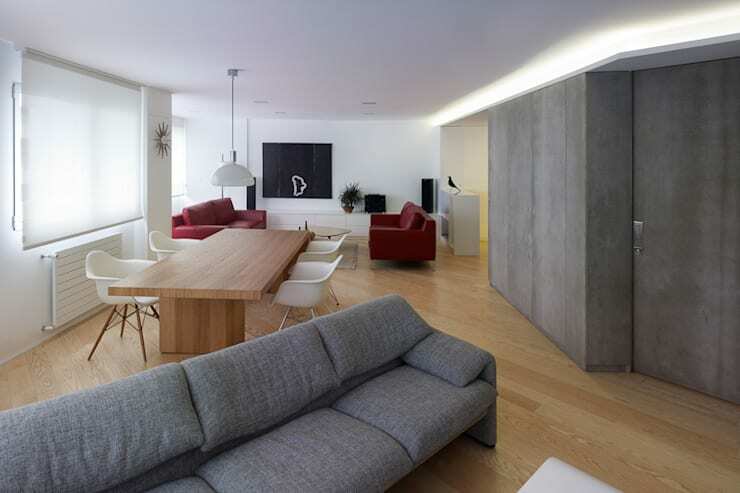 As this area is not on the perimeter of the apartment, it receives little natural light. But it's hard to tell from the brightness of the room. A subtle, sophisticated recessed light has been installed to provide a strong ambience light, while the open doors to the living area allow window light to spill into the room. Moving away from the folding doors for our final photos, we can see how the architects have dealt with the unusual configuration of the kitchen. The shape of the room is an awkward triangle. 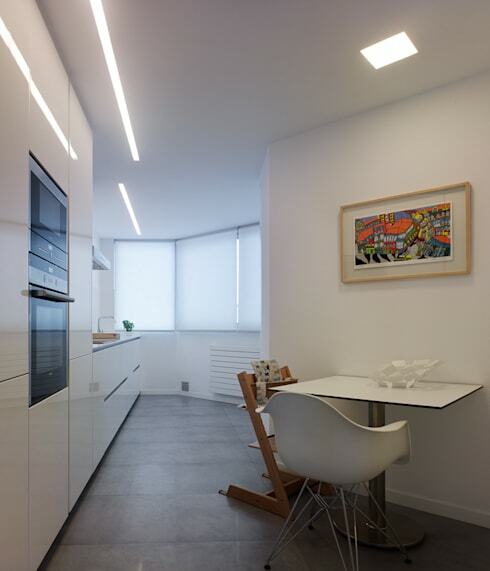 But the architects have maximised the space with a bright, white decor and a kitchen with smooth uninterrupted lines. Even the tiny corner on the right has been used as a small eating area. If you are interested in innovative design solutions, you might enjoy this Ideabook Innovative home storage solutions. Do you think the folding doors are a good idea? We'd love to hear in the comments below!